This page was saved using WebZIP 6.0.8.918 (Unregistered) on 02/23/05 15:15:22. Full Color - Touch Screen - Graphic Display - 200 updates /sec. The high speed F805 weigh batch controller is designed to provide efficient production control functions in a wide variety of applications. The panel-mount configuration uses only 6.85" W x 5.31"H of panel real estate, which offers maximum mounting flexibility. As a batching controller the F 805 uses its high speed to provide unmatched accuracy. The power supply can excite / power up to four 350 ohm load cells (or eight 1000 ohm). Applications can include: hopper scales, packing scales, multi-ingredient batchers, bag filling, and others systems that require high speed and accuracy. Strain gage sensors can be connected directly to the F805, and there are two (5.0, and 10.0 V) selectable excitation voltages to provide the correct amount of power for the strain gauges in your application. Up to 100 coded groups of set point values can be preset in the F 805. Each group can include the following information, SP 1, SP 2, FINAL settings, Compensation CPS, OVER, UNDER, and also an Auto Free Fall compensation selection. Set points can operate in two separate modes, simple comparison, or sequential. Finally the set points values have many functional modifiers that can be selected to "fine tune" a system. Timers, filters, start points, and start/stop signals are all available for selection. The touch screen graphic display has two separate display screens available to use at any time. 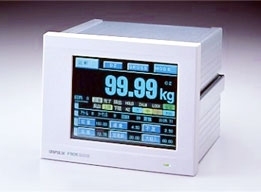 A weight tracking screen with upper and lower limit comparisons, and a graphic "x-y plotting" screen that shows data points in an analog waveform ("loading force" over "time") to aid in troubleshooting the initial start up sequence and for system troubleshooting. The maximum load (y-axis) and maximum time period shown on the waveform display (x-axis) are selectable in an easy to use setup mode. The full color, wide view, touch screen can have its display adjusted to fit the application and lighting within its area of operation. Both contrast and backlighting are adjustable through the front panel. System accuracy (non-linearity) is 1 part in 10,000 divisions (0.01% full scale) legal-for-trade, or 1:40,000 expanded resolution mode. Calibration is simple, cycle the front panel into the calibration mode, press ZERO wait a few seconds to establish a zero reference standard, then enter the millivolt value of the sensor you are calibrating. System dead load (mounting plates, hoppers, etc.) can be compensated for by a dead load weight entry. (c)Copyright 2004 UNIPULSE Inc. All rights reserved.